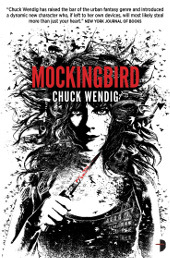 Mockingbird is the second in the Miriam Black series by Chuck Wendig, following on the heels of 2010’s Blackbird (reviewed here at Mountains Of Instead). Miriam is a loner, an angry and twisted dropout with a healthy disrespect for authority and a venomous tongue. Since her teens she has drifted around the highways of the US, hitching rides and picking up what little money she can to get by. What sets her apart is the fact that any skin-to-skin contact with another person allows her to see, in graphic details and down to the minute, the manner of their eventual death. The first novel set the background to the tale, describing how Miriam used her power to follow the soon-to-be deceased, looting their corpses when they drop. Having long ago had it demonstrated to her that she could never change the inevitable she discarded any sense of morality and resigned herself to a life alone. Until a certain trucker stepped into her life, causing her to rethink. Cue a kindling romance, an escalating conflict with a sinister criminal and an eventual reason that the future may not be as fixed as she once believed, just so long as the scales remain in balance. At the start of Mockingbird, Miriam has settled down to life with Louis and is realising what happens when a bird is caged. The monotony of a nine-to-five job, the constant vigilance to ensure she never so much as brushes against another human and the fact of Louis’s job keeping him from her for weeks at a time are wearing her down. Something is about to snap in her when she is saved by a job, suited to her particular talents. …, a friend of Louis working at a school for troubled orphan girls, believes her life is soon to be cut short by cancer and wants to know for sure, freeing herself from the uncertainty and stress. The lure of a cash reward and a chance to use her power is too much to resist and the pair set off. Of course, things are never going to be as straightforward as they seem. The remainder of Mockingbird turns into a game of cat and mouse with Miriam pitting her wits against a twisted serial killer targeting the charges at …’s school. What should be a routine thriller is given more mileage by the unique nature both of Miriam’s talents, not to mention her tenacious nature, and the depravity of the killer she finds herself squaring off against. Wendig’s characterisation is as strong as ever, giving life to what could easily have been a two-dimensional cast in another author’s hands. Dependable Louis, neurotic … and the slippery PE coach head up a cast of believable characters with plenty potential for interesting interaction. So Mockingbird still ends up with a passing mark. It’s a good read, mindless fodder for holiday time if you prefer your fiction with a darker tinge and some sarcastic bite to it. It’s not perfect and it fails to live up to Wendig’s potential but it still sits head and shoulders above the majority of titles in the genre. One for reading when one requires a guilty pleasure heavy on entertainment and light on substance. Forgot to link to a couple of reviews I did for The Mountains Of Instead recently. First up is Peter Heller’s The Dog Stars, a very touching post-apocalyptic tale which threatens to cast you into a pit of depression but instead ends on a wonderfully uplifting note. Ostensibly the story is about Hig, a former pilot who is one of the few survivors of a virulent plague which decimated mankind, leaving only a few groups of stragglers behind. He struggles through his day to day existence with the company of his ageing beagle, Jasper, and survivalist gun nut Bangley. Every day is spent dwelling on the past, the loss of his wife and the dim prospect of continuing like this until a pointless end. However, further tragedy soon leads him to re-evaluate his lot and start making changes. You can read the full review here. Second we have an entirely different beast, Blackbirds by Chuck Wendig. This is the tale of Miriam Black, a woman drifting from town to town across the USA, leaving a trail of bodies in her wake. Miriam is no murderer, rather she is cursed with the ability to see the precise manner and time of anyone’s death simply by making skin contact. Full of self-loathing and anger, she follows those she knows are about to die, waiting like a vulture in the background before relieving them of their now-superfluous cash. Unfortunately this kind of power cannot remain secret for long and soon she is pursued by some rather dark elements who seek to use it for their own ends. Check it out here.